Spring 2012 marked the initiation of a restoration program for the Affleck house which seeks to accomplish a number of primary goals. Obviously, returning the house to a proper state of repair to ensure its future is at the top of the list. Beyond that, we would like to integrate the house into the University and community programs and make it available as a teaching tool and a conference / meeting venue. Electrical and mechanical systems need upgrades for that to occur. Window glass replacement, kitchen restoration, landscaping and other aesthetic improvements are also necessary to achieve that goal. However, the first phase of the work was aimed at correcting deteriorating masonry, and correcting those problems that engendered the problematic conditions. With the structural issues addressed, we can proceed to the other aspects of the project. This overview shows the north side of the house where the entrances are located. While we were able to procure matching brick, original brick was recovered and is available for re-use at a substantially higher rate than anticipated. The asphalt circular drive is not original and will be removed. The asphalt drive has itself caused (or at least contributed to) some of the problems we are experiencing at the driveway retaining wall. During the rain, water runs down the drive and onto the concrete apron under the entry canopy. Although that concrete apron was fitted with a catch basin, its discharge location is unknown and its function is in question. As water collects on the concrete, and is unable to drain, it is diverted against the retaining wall, which wasn't fitted with any sort of functional relief measures (the demolition did reveal a drain that had obviously been filled with debris for years). That water pressure likely contributed to the damage at the retaining wall the current work is correcting. The sand bag dams are in place to temporarily mitigate this condition until it can be corrected permanently. The repairs largely entail removal of the asphalt drive which will end much of the drainage onto what is now the concrete portion of the drive. The concrete itself will be replaced with crushed limestone consistent with the original design, which will also reduce water collection in that much of what falls on the limestone will simply leach into the base soils. We do plan to install a relief tile in a gravel bed (together with relief measures in the retaining wall itself) parallel to the drive side of the retaining wall which will discharge any water that does collect into the retention pond to the East. As there should be little water collection, that really an insurance measure to alleviate anything that does collect against the West side of the wall. Right; The retaining wall holding back the drive and the roof access stair was pushing progressively away from the adjacent structure. While this photo doesn’t show the extent of the movement, it was apparent the wall was out of line by nearly 3 inches approximately 3 feet above the base. Prior maintenance had consisted of packing the widening gap with mortar. While that may have temporarily stopped moisture intrusion from the side of the wall, it of course failed to address the underlying cause. It was apparent that the structure was moving, it was necessary to ascertain the cause of that movement, and it was of course necessary to stop it. The concrete pad at the entry canopy and the asphalt extension to the street aren't original either. Both will be removed and replaced with crushed limestone. Not only is crushed limestone original, it is cheaper than any other option and it is far greener. The concrete walk under the canopy will be extended to the canopy line and trimmed with pavers to match the house. Perimeter roof drains discharge on grade. Where grade included a planter box adjacent to the entry, that discharge was directed through to grade with a clay time. However, over time that solution proved marginally effective and resulted in deterioration of the planter boxes. Boxes have been removed and will be re-built pending resolution of an appropriate design solution to handle roof drainage at that location. The retaining wall holds back the drive and the entry canopy walkway from the ravine to the East. Much of the wall is in excellent condition. However, directly adjacent to the house, South of a natural masonry joint separating the wall adjacent to the drive from the wall adjacent to the walkway, the wall had bowed noticeably outward. Although evaluations suggested the condition had not compromised the structural integrity of the house, repairs were obviously necessary to ensure long term stability. Adjacent to the North facade is a concrete stairway that leads down into the ravine to the base of the retaining wall (to the left) and to the route of the old stream (to the right). There were a few surprises when the brick masonry was removed from the retaining wall. Note that over the entire wall there are fewer than 6 wire ties between the masonry and the concrete back-up. The concrete back-up itself is bowed and cracked in the same pattern and location as the brick. The concrete wall was not reinforced, and despite being nearly 12 feet tall it was less than 8 inches thick, nor was it tied to the wall adjacent to the stairs that intersects it at a 90 degree angle. Given that, along with the drainage issue, the condition is not at all surprising nor unexpected. The concrete itself was something of a surprise. All of the consultants who afforded opinions prior to demolition opined that the back-up was some sort of concrete masonry units (concrete block), which hopefully could be repaired. Finding the poured concrete instead was a surprise, and it injects an element of difficulty in that the wall cannot be repaired, but must instead be removed and replaced. Obviously the concrete wall must be replaced before the masonry can be reinstalled. We anticipated the concrete stairs would be replaced as they have moved, and as they aren't tied into anything at the top or the bottom. However, removal of the brick masonry to expose the stairs revealed that the masonry rests on the stairs, which in turn appear to float on a simple earth form. In addition the wall to the North (right in the photo) did not appear to rest on a footing. By contrast, the wall on the South (the left in this photo) is a basement wall and should have had a footing that is wide enough to support the masonry. After the stairs are removed the plan was to excavate on the South to expose the footing and lay 4 inch concrete block up to just below the line of the stairs, changing to brick at a point where the wall is exposed. Some underpinning will likely be necessary on the North to install a proper footing to provide support for the brick. While that has a budget impact, given the deletion of the contemplated brick pavers at the drive in lieu of the historically accurate crushed limestone, it is manageable. In addition, the masonry and driveway work is funded through material donations by a number of local tradesmen and suppliers together with receipts from limited edition pens handmade by LTU Alumnus Frederick F. Butters. Pens are fabricated from small scraps of the Tidewater Cypress siding removed from the house during recent maintenance work. To date we have raised over $30,000.00. Thanks to everyone who has supported that effort. Pens are fitted with copper hardware and come with a certificate of authenticity and a presentation box bearing the Affleck stylized "A". They are available in either ballpoint or fountain design. 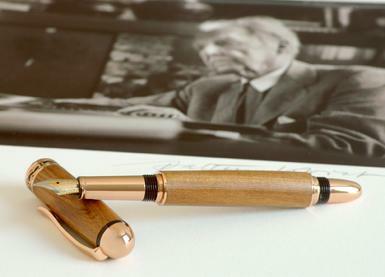 At $400.00 per example, they support a good cause - and besides, where else can you get a pen that you can honestly say was specified by Frank Lloyd Wright? Production is limited to 100, after which no more will be made. Contact the University or send me an email if you have an interest. Get one now as there are few left.